Cambridge, MA; USA/London, Ontario; CANADA—Fanshawe College’s new Canadian Centre for Product Validation (CCPV) is a one-of a-kind facility in Canada (one of only three in the world). The expansive 25,000 square-foot, two-story Centre houses ultramodern validation technologies for product prototyping and testing. 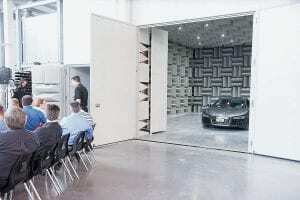 Among those trappings is an Eckel Noise Control Technologies anechoic chamber that enables the highest quality of noise performance testing available. The CCPV opened its doors for business on June 1st and is fully operational, offering multimodal product testing to new and established companies of any size worldwide. 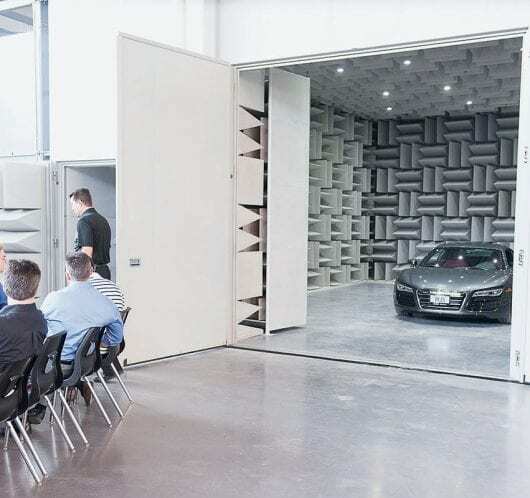 The Eckel hemi-anechoic chamber is being used to assess the acoustic noise performance of products ranging from small medical devices to entire vehicles, as well as product components. It is the second largest chamber of its type in the Province of Ontario, and is rivaled in performance only by chambers located at automotive OEMs in Michigan, USA. Its dedicated air handling unit and vehicle exhaust extraction system allow vehicles to idle during noise tests. And, while the isolated floor was designed to support vehicles weighing up to 21 tons, the CCPV actually tested it to 32.5 tons—reporting that the room, doors and floor remained perfectly balanced. “The CCPV represents the absolute cutting edge of product testing and validation. 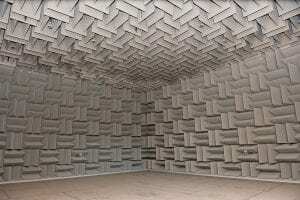 The fact that it chose one of our anechoic chambers to handle its noise performance testing is a huge honor. It signifies that our chambers offer the ultimate in custom-engineered acoustic testing and research structures,” said Eckel Vice President Jeff Morse. Externally, the Eckel chamber measures 36 ft., 4 in. long by 31 ft., 4 in. wide and 17 ft. 2in. high. Inside the chamber, the walls, ceiling and doors are covered with Eckel’s proprietary EMW Perforated Metallic anechoic wedges, painted white. The internal dimensions are 30 ft. long by 25 ft. wide and 14 ft. high. To accommodate the largest testing objects (i.e. entire vehicles), the chamber has a 9-ft. by 11-ft. wide double door. A personnel access door measures 3 ft., 6 in. by 7 ft., 6 in. The chamber has a 100 Hertz cutoff, and the maximum background noise level within the chamber is 14-20 dB. It has been qualified to ISO 3744 using broad band noise and ISO 3745 using broad band noise and pure tones. The CCPV will perform testing for new or improved products primarily in the thermal, mechanical, electrical and environmental areas of the aerospace, automotive, consumer goods, medical, military and renewable energy sectors. It can provide services on a fee-for-service basis, or access government funding to help a company develop new products. The CCPV is equipped not only to test products to known specifications, but also to determine a product’s functional limits, analyze the product relative to a variety of protocols outside the standard test specifications, and more. In addition, the CCPV can perform tasks such as pre-development market studies as well as post-development commercialization activities. The CCPV is a wholly-owned for-profit subsidiary of Fanshawe College and is located off-campus in the City of London, Ontario’s Advanced Manufacturing Park. Fanshawe students will gain meaningful and relevant learning experiences through co-op placements and internships at the CCPV, as well as through applied research projects for industry clients involving both faculty and students. With expertise in creating optimal sound environments, Eckel Noise Control Technologies has been at the forefront of acoustic analysis and design for more than 60 years. Headquartered in Cambridge, MA, Eckel helped to create the world’s first Anechoic Chamber at Harvard University. Since then, the company has pioneered chamber design for use in product testing—from cell phones to cars to jet engines—helping engineers and manufacturers achieve exceptional quality standards. Building on the science behind its chambers, Eckel’s Audiometric Rooms create the ideal controlled environment for hearing testing and other sound isolation applications; while its Acoustic Panel Systems provide precise control of reverberation and background noise in any setting—from auditoriums and gyms to concert halls and industrial facilities. No matter the acoustic challenge, Eckel has a sound solution. Learn more at www.eckelusa.com.